Facilities: FCI Florence with an adjacent minimum security satellite prison camp. 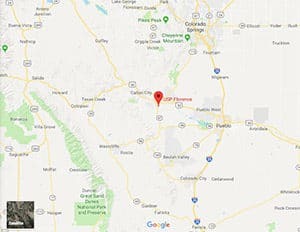 Location: FCI Florence is located on State Highway 67, 90 miles south of Denver, 45 miles south of Colorado Springs, and 40 miles west of Pueblo. Background: FCI Florence was opened in 1993. The satellite camp opened in 1992. Both facilities are part of the Florence Federal Correctional Complex (FCC). Notable inmates include Francisco Duran (serving a 40-year sentence for attempting to assassinate U.S. President Bill Clinton), former Baltimore Police Detective William King (serving a life sentence for stealing cash and narcotics), and Brent Beckley (served one year for unlawful internet gambling, wire fraud, and bank fraud). Housing: Inmates are housed in two-person cells within the eight housing units. In the camp inmates are housed in dormitories within the two housing units. Health Services: Sick call, dental call, physical examinations, medications, eyeglasses, chronic care, preventive health services, emergency services, and diagnosis and treatment of chronic conditions, and mental health care are provided to inmates at FCI Florence. Mandatory HIV testing is performed when there are risk factors and the test is clinically indicated and/or surveillance testing is required. MRSA and TB screening are also conducted annually. Residential Drug Abuse Program (RDAP): Both FCI Florence and the satellite camp house a Residential Drug Abuse Program (RDAP). A Drug Education class, the Non-Residential Drug Abuse Program (NR-DAP), Alcoholics Anonymous (AA), Narcotics Anonymous (NA), and People In Prison Entering Sobriety programs are also provided. Education Services: FCI Florence provides GED and English-as-a-Second Language (ESL) programs. Courses are also offered in Social Education-Life Skills, Parenting, Adult Continuing Education (ACE), and Career Counseling/Release Preparation. High school diplomas and post-secondary programs are available through paid correspondence programs. Advanced Occupational Education: FCI Florence offers advanced occupational education programs in Building Trades, Cabinet/Furniture Maker, Computer Assisted Drafting, and Restaurant Management/Culinary Arts. Both facilities offer Green Energy. Vocational Training: FCI Florence does not offer any vocational training aside from its advanced occupational education programs. Apprenticeship: FCI Florence does not offer any apprenticeships. Library Services: Leisure and law libraries are available through the Education Department. Inmates can check out fiction and nonfiction books, magazines, and newspapers. In the law library inmates can use the TRULINCS Electronic Law Library computers, typewriters, and copy machine. UNICOR: The FCI Florence UNICOR facility produces office furniture. Recreation: At FCI Florence, inmates have access to both indoor and outdoor recreation facilities where personal fitness, group sports, and hobby craft projects can be undertaken.